Choosing a backpack to go travelling with can be a bit of a minefield – there are so many options to choose from and a whole range of styles, features and of course budgets to navigate.So when the guys from Code 10 Backpacks asked me to put their C10 Backpack through its paces on the road I was keen to see what this successful Kickstarter backpack had to offer. The Code 10 Backpack range are all marketed at adventure travellers and have been built with that in mind – boasting some handy features that make life that much easier. So what are the key features of the C10 Backpack that I tested out? For me the two features that stand out the most are the fact it’s waterproof and the inbuilt security – two things I’m always on the look out for in a backpack! 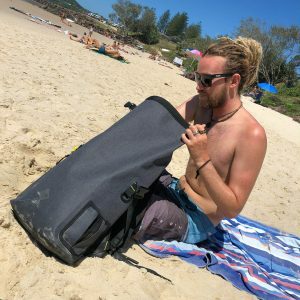 The C10 Backpack in it’s most basic description is a pimped out version of those rollable waterproof bags used by divers – a travel accessory I’ve carried around for years as it makes carrying gear on snorkel and dive trips that much easier! The C10 boasts that same waterproof design but in a 40L day bag complete with comfortable straps and extra pockets to easily reach items that you need to hand – such as your phone, passport or credit card. For many people though the inbuilt locking system will be a real selling point. The bag itself is equipped with with a. Metal cable locking system which easily hides away when not in use. This can then be quickly used to secure your bag to something solid (like a hostel bed or even palm tree!) so you can rest assured its safe and secure. The system can also be used to simply lock the bag too – perfect for overnight buses, flights or just for use in a hostel room. As well as these two solid features it’s also worth pointing out that the bag was extremely well built, felt incredibly durable and was also really comfortable too – 3 things that you should be looking for in any backpack that you’ll be travelling with. Ideal For A Day On The Ocean! 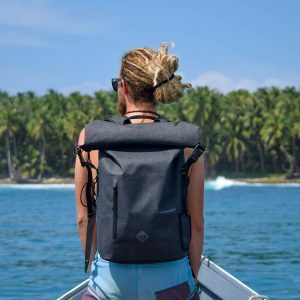 I gave the Code 10 C10 Backpack a solid run for its money on my recent surf trip to the Mentawai Islands and it was the perfect day bag for an epic day hunting waves. Not only did the waterproof design mean I didn’t have to worry about my camera kit getting splashed (including the new Mavic Air drone I’m reviewing) the the array of straps and buckles also meant I could easily secure it so it wasn’t rolling around everywhere! The hip picket also served as the perfect place to stash my phone so that I could quickly access it is I wanted to take pics…which of course I did a lot being surrounded by so many stunning islands! The other flip side to having a waterproof bag like the Code 10 Backpack is you can also use it in reverse to store your wet gear, so on the way home I packed in my boardies and towel so they wouldn’t soak the rest of my stuff! Of course you need to make sure you dry it out properly before using it again, but its a handy thing to keep in mind! …Just Be Prepared To Dig Around! The biggest niggles I had with the Code 10 Backpack were the entry system and the fact the inside colour was black – which both kind of combined into the same issue. Basically it was pretty difficult to find stuff quickly and I often found myself digging around elbow to shoulder deep trying to locate smaller items I’d chuck in for the day. Sure it does come with the laptop sleeve (which also has pockets for phones, cables and other small items) but compare that to the Slicks Carry On Backpack which is super organised and it just didn’t feel quite as user friendly – especially if you were looking for a day pack which you’d be using as your carry on luggage as well. However it’s worth saying that Code 10 have now also released the C10 Daypack – which has a revised entry system and also a white interior – which overcomes the only two things I wasn’t keen on and they do also have a duffel and messenger bag option too depending on the style you’re looking for. Ok so what’s the pricing the the Code 10 Backpack? 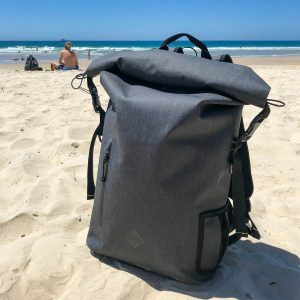 Well it’s not the cheapest investment at $129/£97 – but if you’re hitting the road and want a durable, waterproof day pack that will handle life on the road it’s definitely worth checking out and it’s also available in black, grey and blue so you can pick the design that suits your style. Personally though it looks like the extra $10 for the C10 Daypack would be a better choice and that would be my recommendation – I’ll be testing that one out soon too so I’ll keep you posted! Which day pack do you use for your travels? The bag is looking great. Is it available in India ?